Ayoze Perez's first-half goal earned Newcastle a fortunate first Premier League away win of the season as they leapfrogged Bournemouth in the table. Perez scored from Newcastle's only shot on target, with Adam Federici failing to stop his tame effort. The result was very harsh on a dominant Bournemouth, who were denied by a string of brilliant saves from Newcastle goalkeeper Rob Elliot. The Cherries, six league games without a win, slip into the bottom three. Eddie Howe's side, promoted to the top tier from the Championship last season, could have done little more to win in the game. Newcastle little less. But the hosts were let down by poor finishing and a man-of-the-match display by Elliot as they chalked up 20 efforts on goal to Newcastle's two. Rarely can Newcastle have come away with a victory after threatening the opposition's goal on so few occasions. Aside from Perez's crucial strike, Fabricio Coloccini's second-half header was the Magpies' only other effort on goal, and they spent most of the game defending as Bournemouth poured forward from the flanks. But having failed to score in a goalless draw against Stoke last weekend where Potters goalkeeper Jack Butland was equally brilliant, Newcastle boss Steve McClaren may feel that his side warranted some fortune. Republic of Ireland international Elliot was an injury doubt for the game, yet played a telling part in what could be a critical win, their first in 13 away league games. Bournemouth's bright beginning to the season has tailed off in recent weeks after crucial injuries to key players such as Callum Wilson, Tommy Elphick and Max Gradel. Several pundits have suggested that they should alter their style but another energetic performance from his team ensured that at no point did Newcastle have any sort of control. Midfielder Harry Arter, Gosling and Ritchie were indefatigable as the Cherries out-ran and out-passed their opponents. And the attacking threat was relentless as they peppered Newcastle's goal from both flanks, chalking up 16 corners to Newcastle's none. Joshua King was twice denied by Elliot, also stopping Ritchie's diving header. But his effort to deny Gosling was perhaps his finest moment when he threw himself to his right to prevent the midfielder scoring against his former club from close range. After putting so much energy into the performance, it was no wonder that Bournemouth eventually tired. At the end, some of their players looked mentally and physically worn out, but now they must gather themselves for the international break realising that, at least in terms of performance, they are on the right track. On the basis of this game, only their finishing can be improved upon. Bournemouth manager Eddie Howe: "It was very cruel for us today, we were excellent and controlled the game from start to finish. The goal was against the run of play and the frustrating thing for us was we kept knocking on the door and we felt it would come but it just wasn't meant to be. "I can't fault the quality of the performance, the only missing thing was the goals on top of it. The last part of the game we lost belief, but apart from that I'm very pleased with the players. There's a lot of positives in the game, we can't dwell on the defeat. "We've played better than that, you can't explain football sometimes. We've played far better, created chances and been denied by goalkeepers but this week we had one bit of quality for the goal and the rest of the time we were defending for our lives and relied on our goalkeeper. "Bournemouth will be disappointed with their finishing but we got the luck today and we had a great defensive performance to get a clean sheet which is what you need sometimes." Bournemouth have only kept one clean sheet in their 12 Premier League games this season. Georginio Wijnaldum has been directly involved in eight of Newcastle's 13 goals this season in the Premier League. Bournemouth's 20 shots were their most in a Premier League game this season. Their 67.53% possession figure in the defeat was also their highest figure in a Premier League game this season. The Cherries out-ran Newcastle by 119 km to 114 km, and have done so in each of their league games this term. After the international break, Bournemouth travel to Swansea before hosting Everton the following Saturday. Newcastle are at home to Leicester before a trip to Crystal Palace. Match ends, Bournemouth 0, Newcastle United 1. Second Half ends, Bournemouth 0, Newcastle United 1. Attempt missed. Matt Ritchie (Bournemouth) left footed shot from outside the box misses to the right. Assisted by Lee Tomlin. Yann Kermorgant (Bournemouth) wins a free kick on the left wing. Foul by Kevin Mbabu (Newcastle United). Substitution, Newcastle United. Kevin Mbabu replaces Vurnon Anita. Attempt missed. 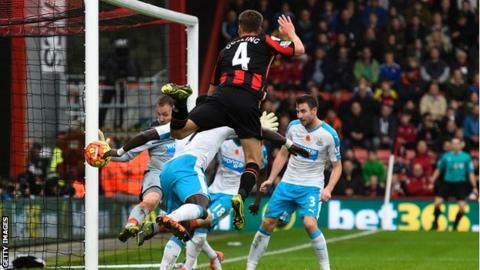 Matt Ritchie (Bournemouth) left footed shot from outside the box is just a bit too high. Assisted by Andrew Surman following a set piece situation. Offside, Newcastle United. Georginio Wijnaldum tries a through ball, but Papiss Demba Cissé is caught offside. Attempt missed. Fabricio Coloccini (Newcastle United) header from the right side of the six yard box is just a bit too high following a set piece situation. Florian Thauvin (Newcastle United) wins a free kick on the left wing. Corner, Bournemouth. Conceded by Chancel Mbemba. Attempt blocked. Matt Ritchie (Bournemouth) left footed shot from outside the box is blocked. Assisted by Tokelo Rantie. Substitution, Bournemouth. Tokelo Rantie replaces Harry Arter. Substitution, Newcastle United. Florian Thauvin replaces Ayoze Pérez. Foul by Sylvain Distin (Bournemouth). Fabricio Coloccini (Newcastle United) wins a free kick in the defensive half. Corner, Bournemouth. Conceded by Daryl Janmaat. Substitution, Bournemouth. Yann Kermorgant replaces Joshua King. Substitution, Bournemouth. Lee Tomlin replaces Junior Stanislas. Corner, Bournemouth. Conceded by Ayoze Pérez. Corner, Bournemouth. Conceded by Cheick Tioté.